It’s that time of year – everyone’s back to school and you’re trying to get settled into a new routine. You may be busy trying to figure out how best to arrange your new schedule, but your dog is probably experiencing the opposite. Now that his humans are back to school, playing sports and doing homework, he’s probably got the house to himself most days. While you’re busy rushing around from school to work to home, how can you ensure your dog is still getting enough food, bathroom trips, and attention? 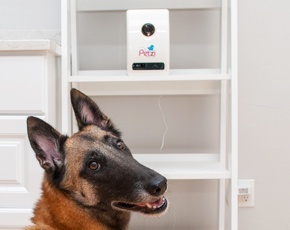 Whether it’s a smart door or a video-enabled treat dispenser, pet technology can help you provide for your pet, even when you’re not home. How you ask? 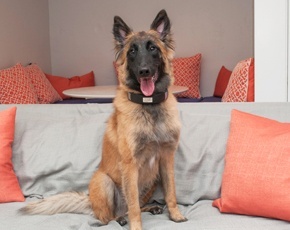 A smart collar can offer you peace of mind that your dog is safe and healthy throughout the day by monitoring your dog’s location and activity. 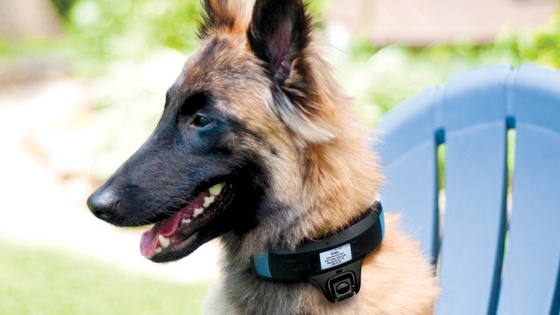 Smart collars can help you keep your dog safely contained with humane deterrents, check in when your dog is barking with live video, and use apps to keep an eye on his activity levels and temperature. One of the main benefits of a smart feeder is the ability to feed your pet even if you’re not there, so there’s no need to worry you won’t make it back in time for his dinner. 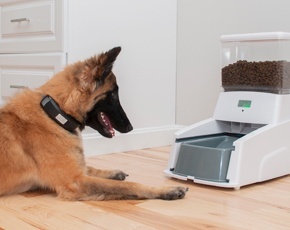 While some feeders simply dispense a set portion of food on a timer (ex: a quarter cup at 6 p.m.), other feeders can connect with your smart collar to deliver portions based on real-time activity data throughout the day, so you can ensure your pup is getting the exact right nutrition he needs to stay healthy. No more racing home on your lunch hour to give your pup’s bladder a break – let him out from wherever you are with a smart door. Worried that another pup (or even a raccoon) could sneak into your home? 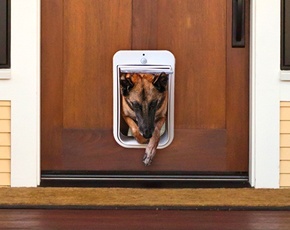 Look for a smart door that uses RFID to ensure that only your dog has access to exit and entry. Ever pause during your busy day and wonder what your dog is doing at home by himself? Get a video-enabled smart treat dispenser! Watch and even talk to your dog with built-in video and audio, then give him a treat to reward him for being such a good boy. The world of pet technology is rapidly expanding and the possibilities for problem-solving solutions are nearly endless. To learn how the Wagz™ smart products work together to provide a completely connected pet lifestyle that solves the most pressing pet-parent worries, click here.